After the bands have finished playing, the veterans have returned home and the world leaders have concluded their speeches, Liam Tarburn will continue honoring those who gave their lives on D-Day. Friday marks 70 years since more than 160,000 allied troops landed in Normandy to overtake Adolf Hitler’s army. More than 9,000 soldiers were killed or wounded, according to the U.S. Army, and one Scottish teen is determined to acknowledge each one. 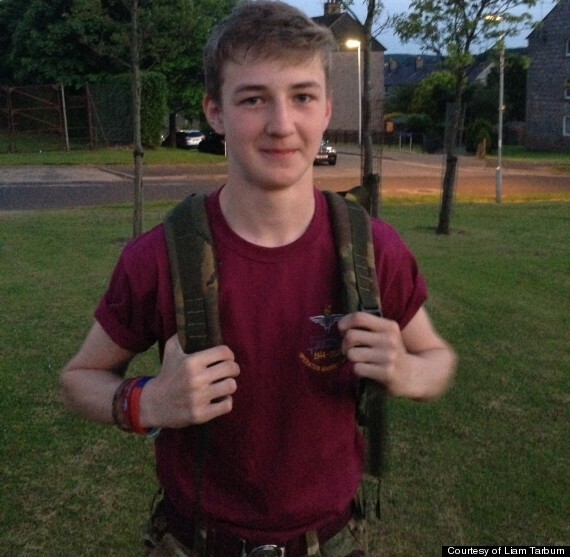 Liam, 15, has committed to trekking 70 miles, for every year since the soldiers stormed Normandy, STV Aberdeen reported. "I want to honor the sacrifice they made," Liam told the news outlet. "They paid the ultimate price for us and they deserve to be remembered." His mission is more than a symbolic gesture, he also hopes to raise funds for the Parachute Regiment Charity, a nonprofit that supports wounded service members and relatives of the fallen. Liam has set a goal of raising 1,000 British pounds (about $1,680). Liam feels particularly connected to the organization since he is a cadet with Para ACF, a voluntary youth group. The determined teen’s mission has garnered the respect of friends, family and the British military. "This is an extremely emotional and important time for all of the Airborne Forces community, past and present, as they reflect on the last 70 years," the army’s headquarters in Scotland said in a statement, according to STV. "This incredible trek that Liam is undertaking shows that the sacrifice that the troops made, some who were not much older than he is now, has not been forgotten." Find out how you can get involved with supporting Liam and his mission here.